I've been traveling for a few days and I'm tired so this will be quick. 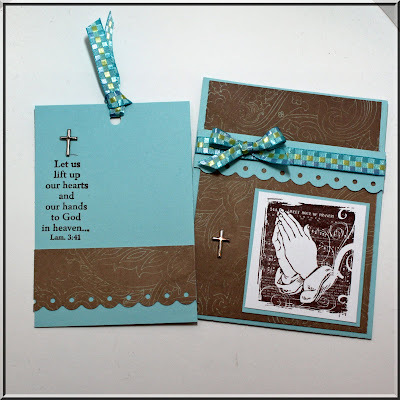 While I was in the motel with nothing to do, I managed to get a pocket card done for the Our Daily Bread Designs challenge. Here is my card using Lift Up Our Hands. Oh my... this is just beautiful!!! I love this stamp set! I love the color combo you used! Just lovely!!! Thanks so much for playing along with us!!! What a wonderful pocket card!!! I love the colors you chose with this set!!! Just beautiful!! Thanks so much for playing in the ODBD challenge!!! Beautiful! 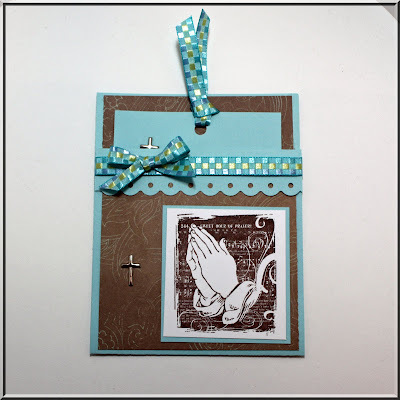 Love the brown dp and turquoise!! Thank you so much for joining us in the challenge!